The “ability, determination and courage” of Melissa Fox, a member of integrated company JOLT Dance in Christchurch, was recognised yesterday by Arts Access Aotearoa and its Executive Director, Richard Benge. Melissa received a Highly Commended certificate in the inaugural Big ‘A’ Artistic Achievement Award, one of six award categories in Arts Access Aotearoa’s Big ‘A’ Awards. The recipients will be announced at an awards ceremony, to be held at Parliament on 18 July. 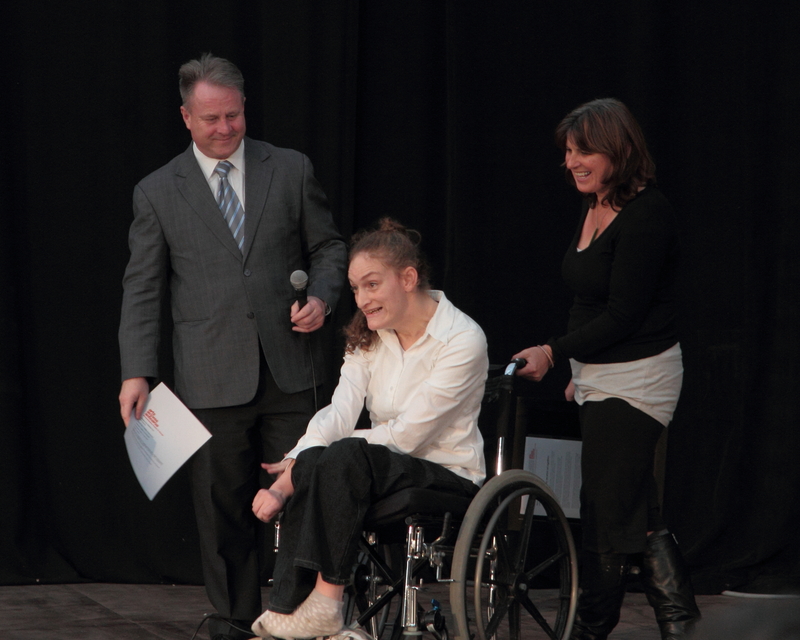 Melissa, who has cerebral palsy and uses a wheelchair, has been performing with JOLT Dance since 2004. When she joined JOLT Dance in 2004, she had very little movement. Since then, she has danced in seven performances, 11 conference works and five annual shows. She now has extensive movement and supports herself out of her wheelchair. JOLT’s Artistic Director Lyn Cotton describes Melissa as a “born dancer”. Lean On Me celebrated the abilities of more than 70 dancers, ranging from four-year-olds through to adults. Lyn describes the show, where disabled and non-disabled dancers performed together, as a celebration of each dancer’s unique movement and skill. The Big ‘A’ Awards are presented by Arts Access Aotearoa every year. They are the key national awards in New Zealand celebrating the outstanding achievements of individuals and organisations working to enhance the artistic lives of people with limited access to the arts. Co-ordinator, Christchurch City Council); Minnie Baragwanath (Chief Executive, Be. Accessible); Rachel Leota (Assistant General Manager – Service Development, Department of Corrections); Erwin Van Asbeck (Manager, Toi Ora Live Arts Trust); Stephen Wainwright (Chief Executive, Creative New Zealand); and Richard Benge (Executive Director, Arts Access Aotearoa). In 2009, JOLT Dance won the Big ‘A’ Creative Space Award, presented in the Grand Hall of Parliament. Melissa Fox and Julia McKerrow, a leading New Zealand dancer and choreographer, performed a work called Duet. Original generation time 3.5165 seconds. Cache Loaded in: 0.0461 seconds.